Boytrapped - The Story of the Statens: California Here We Come! This morning we work up to a surprise from the Easter Bunny. 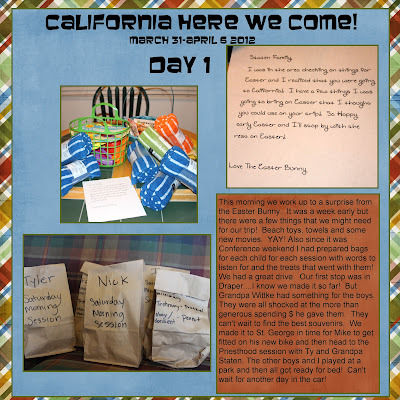 It was a week early but there were a few things that we might need for our trip! Beach toys, towels and some new movies. YAY! Also since it was Conference weekend I had prepared bags for each child for each session with words to listen for and the treats that went with them! We had a great drive. Our first stop was in Draper....I know we made it so far! But Grandpa Wittke had something for the boys. They were all shocked at the more than generous spending $ he gave them. They can't wait to find the best souvenirs. We made it to St. George in time for Mike to get fitted on his new bike and then head to the Priesthood session with Ty and Grandpa Staten. The other boys and I played at a park and then all got ready for bed! Can't wait for another day in the car!